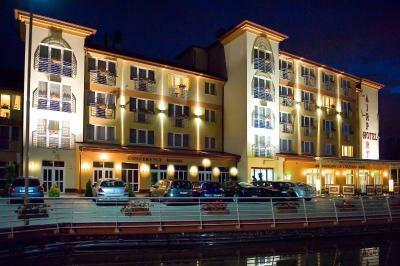 Lock in a great price for Airport Hotel Budapest – rated 8.5 by recent guests! Location was convenient to the airport, breakfast selection was good. 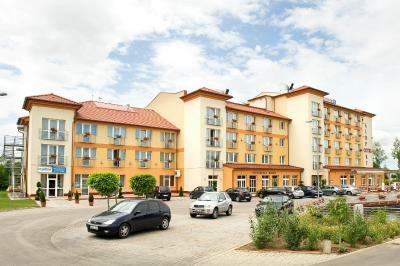 Close to the airport, has a free shuttle from/to the airport. Everything is super. Thanks! 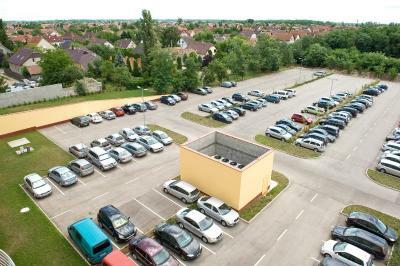 It’s located close to the airport, provides free shuttle service to and from the airport too, also there’s an option to leave the car in the secure parking lot. 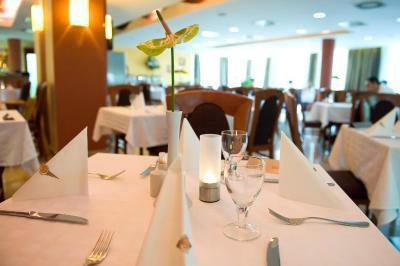 Clean rooms, restaurant opened 24 hours, offers good food. 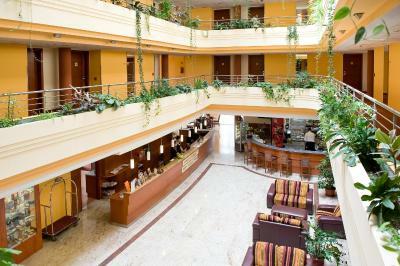 Super convenient if you have an overnight layover in Budapest! Rooms was very dirty!!! Breakfast buffet is dirty. Had a pleasant stay. Good restaurant open 24 hrs. a day. Breakfast from 4 am included in the price. Friendly reception. Great free shuttle, on time. Over all, excellent. They had a shuttle which was very useful and the breakfast was good too. 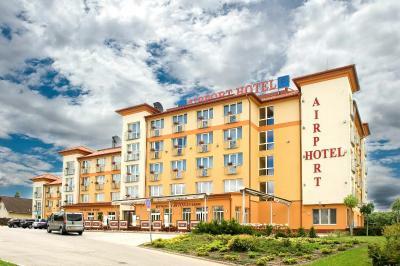 Airport Hotel Budapest This rating is a reflection of how the property compares to the industry standard when it comes to price, facilities and services available. It's based on a self-evaluation by the property. Use this rating to help choose your stay! One of our top picks in Vecsés.The Airport Hotel Budapest is just 2 minutes away with the hotel's own minibus from the airport and offers fine cuisine in its 24-h restaurant, free parking and free Wi-Fi. Room service is available 24 hours a day, and if you are in a hurry you can save time by using the express check-in and check-out. A 24-hour wellness center is available to guests. 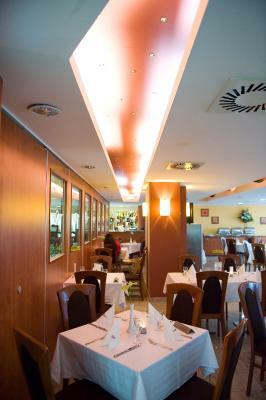 Experienced chefs offer excellent Hungarian and international dishes in the restaurant with its inviting terrace. The café serves coffee specialties and a wide range of cocktails and fine wines.Breakfast is served every morning. 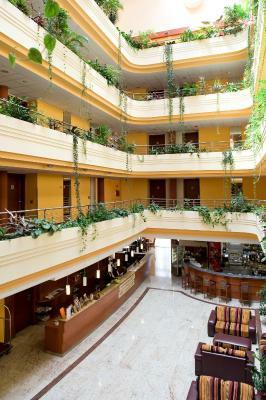 For your meetings or events the Airport Hotel Budapest features 5 multi-functional conference rooms. 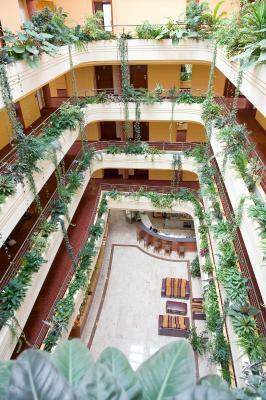 The Airport-Hotel Budapest also features a dental clinic on site. 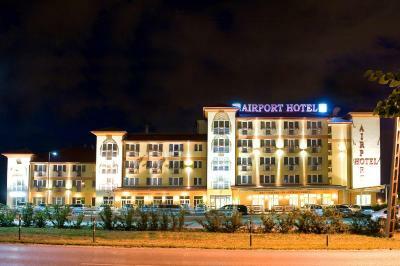 When would you like to stay at Airport Hotel Budapest? 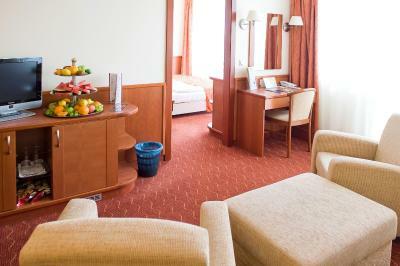 The air conditioned rooms has a balcony, a laptop safe, a minibar and a flat-screen TV with satellite channels. 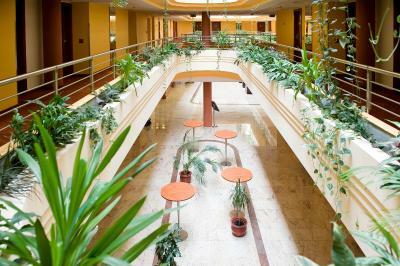 The air conditioned rooms has a balcony and a full kitchen. There is a combined dining and living area with a sofa and a flat-screen TV. 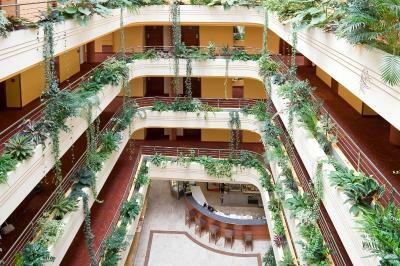 The Budapest’s airport hotel is awaiting its business or independent travelers guests with 110 rooms, conference rooms, meeting rooms, free wireless internet, non-stop restaurant, shuttle and café-bar. 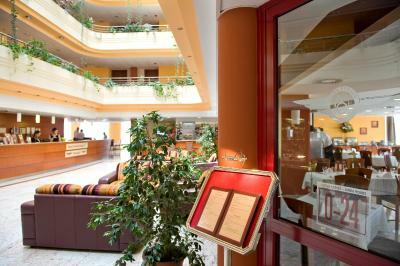 House Rules Airport Hotel Budapest takes special requests – add in the next step! 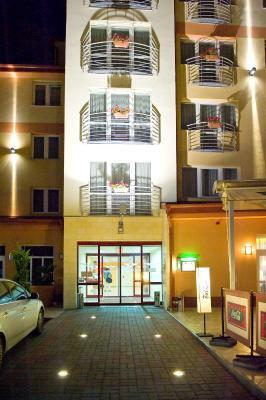 All children from 2 to 12 year are charged EUR 22 per person per night for extra beds. Airport Hotel Budapest accepts these cards and reserves the right to temporarily hold an amount prior to arrival. If you want to make use of the free airport transfer, please provide the hotel with the estimated time of arrival, your full name and the flight number! 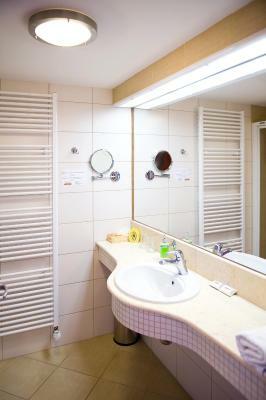 The bathroom can be better, need a little renovation. The price can be lower. 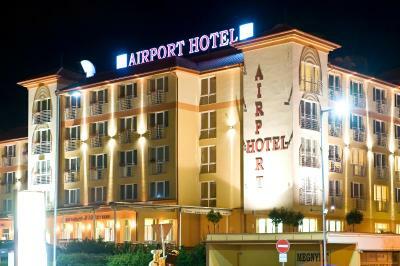 Good location amd service if you will go to the airport. 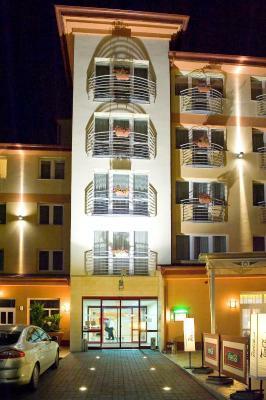 We had contacted the hotel to confirm our arrival time in the evening and that they would pick us up, then also confirmed that our flight into Budapest had been delayed and we would need to be picked up later than expected. We called when we arrived and they said the driver would come to pick us up, and to wait at the Departure level outside. We waited an hour, from midnight until 1 AM, for our ride. The vehicle the driver used did not have any identification, and even though we were waiting EXACTLY where we had been told to wait, he never stopped to ask us if we were waiting for him. Apparently he picked up OTHER people and took them to the hotel but didn't check to see if he had all the people he was supposed to. On top of that, when my husband called to ask the reception desk where the driver was (several times, as you might imagine), the person at the desk gave him incorrect information and even hung up on him one time! We will NEVER stay at this hotel again! She is not the youngest one. But everything is quite allright and it works. It's a very dark hotel lights might help. It's quite a way from the airport will not use it again will use Ibis in future. Calling for the shuttle service could not have been worse! Told to report to the wrong location! Aircon not working in the room! Terrible stink from the drains when the windows were opened. Breakfast was disappointing. 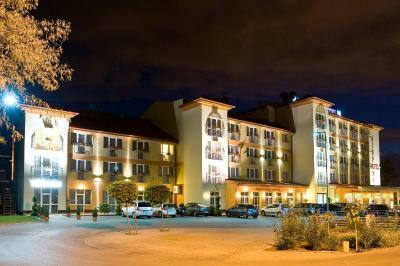 I'm using this hotel quite often and it is always 1 night overview, for which I can not complain at all. Breakfast is said to be included in the price and they repeatedly said our nightly departure wouldn't impede on us having it. Yeah right. They started preparing it way too late, not just in time as they had promised, and the 10 people in the shuttle service bus were left to depart hungry without any apology. Totally lousy and scammy. You just don't mess with breakfast. 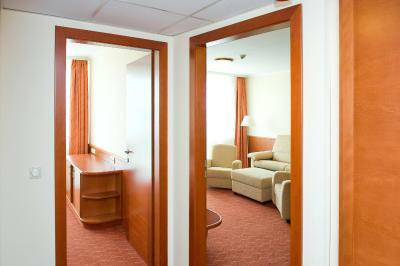 Good location, clean and spacious rooms. From arrival until departure I enjoyed my stay. If you want to stretch your legs then the shops are only a short distance away. 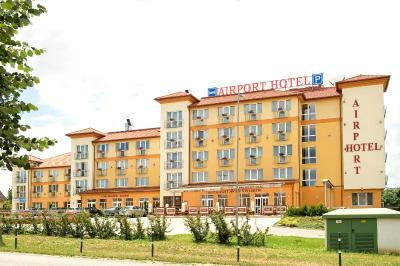 Nice staff, Good location to airport. The staff on the reception have not been trained very effectively in customer service. I had to telephone six times from the airport to arrange the shuttle. Despite telling me that she could not hear me over the phone, the receptionist failed to understand that I could not hear her and twice told me off for not standing in the right place - although the place in question was vaguely described by her. I waited forty-five minutes in the end. The hot water system failed by the morning and I had no shaving water and a cold shower. The reception offered me a free drink as compensation. This is far and away the most expensive hotel that I have stayed in in Hungary, yet rates amongst the poorest in customer service. I have been working in the country for three months already.